The ending of Avengers: Infinity War may be so much of a shock to fans, they may not realize that the mystical Soulworld has just been introduced to the MCU. At least that's what the directors of Infinity War appear to have pulled off with no warning or explanation. But believe us: this mystical plane of the dead may be the key to restoring the Marvel heroes in Avengers 4. To the comic fans who actually know the comics upon which Infinity War was based, and the ways the Infinity Stones reshaped the Marvel Comics Universe, a glimpse of the all-important Soulworld is a no-brainer. For the fans who prefer the movies... some explaining is probably needed. Related: Which Infinity War Deaths Will Be Permanent? We can't make the heartbreak of Infinity War's ending fade any faster, but we can explain the strange reunion between Thanos and Gamora, how it fits into Soulworld mythology, and why it may hint at countless MCU heroes coming back to life. The trip to Soulworld comes as a total surprise in the film's climactic moment. So much of a surprise that most audiences may not make the connection between the orange-colored Soul Stone, and the orange-colored oasis Thanos is suddenly transported to. One second he's snapping his fingers to destroy half of all life in the universe, then a flash of light, and he's in a dream world reunited with Gamora - back to being a child as she was when he first found her. The villain's sudden arrival to this new location, and the current, not flashback-ish questions from Gamora may confuse most viewers, but comic fans know this is almost certainly Soulworld: the pocket dimension (of unknown size) contained within the Soul Stone itself. 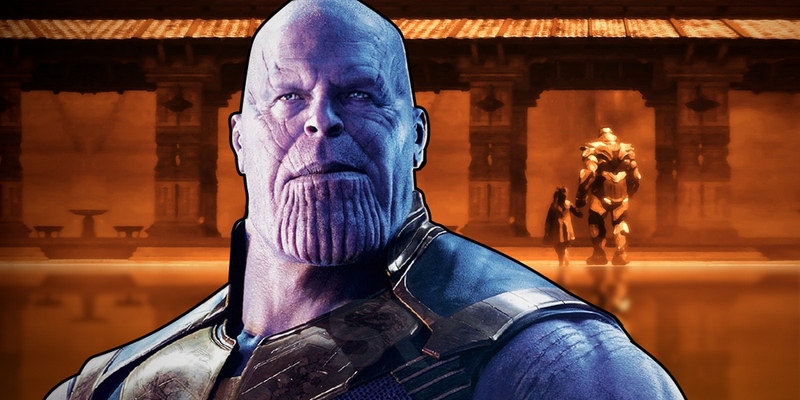 The color, the calm, and the company all confirm Thanos has made his first trip into Soulworld... but it may not be his last. Because it isn't a fantasy he sees before him. This may defy the logic of the film, since audiences saw Gamora fall to her death as the cost Thanos had to pay to claim the Soul Stone. But in the mythology of the comics, the Soul Stone was powered by (and hungers for) living souls. Literal spirits of people the Stone's master defeats, transported into the pocket dimension Soulworld. There are worse fates, since Soulworld is practically a paradise molded to the individual inside of it (their own personal Heaven, unaware that they are secretly trapped). "To ensure that whoever possess it understands its power the Stone demands a sacrifice... In order to take the Stone, you must lose that which you love. A soul for a soul." So more casual fans are aware, this entire concept of the Soul Stone being "special" or claimed through some kind of trial is entirely created for the movie. Perhaps its also meant as a security measure, assuming anyone who would use the Soul Stone to kill all life in the universe wouldn't have someone they loved to sacrifice (probably why Red Skull can't possess it). The journey may be different from the comics, but the destination is the same: Gamora residing inside of Soulworld (likely in a paradise of her own making, hence her return to the age she was last happy). It's a small moment, but it illustrates a bigger point for fans going forward. We won't suggest that all of the lives claimed by the Soul Stone are actually contained inside the Soul Stone, waiting to be released and the tragedy of Infinity War undone. That's not how it worked in the comics, and only a select few were ever able to enter or exit the Soul Stone unscathed. Granted, the movies are making plenty of changes to the core mythology of the Infinity Gauntlet comic. But to take such a massive step and suggest that Gamora surviving in the Soul Stone means the souls of half the universe could is a stretch. So why include this brief, enigmatic scene at all? Because it alone suggests that Gamora isn't entirely erased from this story. Set the scene in the orange-colored realm of the Soul Stone, and every curious fan understands that death is less than permanent when the Infinity Stones are involved - even if you see someone pushed off a cliff to their death. Most savvy fans will know the instant half of the MCU's stars "die" that they will be coming back eventually. But end this story with the inherently hazy afterlife of Soulworld, and the idea that a fallen hero's paradise is reliving their last happy memory? You end up with not only a hope that dead heroes can be brought back to life, but a compelling reason for some of the dead to prefer their afterlife to their real one. We'll have to wait and see if Avengers 4 delivers, but for now, we'll direct our theories towards Soulworld - as practically instructed to in this mysterious little scene.